A new star is to be added to the ‘Walk of Fame’ of classical music: violinist Eric Silberger’s charisma, unusual security and mastery are the threads that tie him to virtuosos such as Paganini and Sarasate. In the second part of the concert, the Konzerthausorchester gave an extraordinary performance of beautiful and romantic Rachmaninoff’s Second symphony, fully fledged with musicians in the string section. Focusing on the first part of the night, it was impressive and outstanding the sound produced by Eric Silberger on his Guadagnini’s violin (violin from 1757, on generous loan from the Sau-Wing Lam collection), above all on the high register. From my personal taste, his phrasing could have been more nuanced in some fragments. I am eager and curious to follow the natural development of Eric Silberger’s sound and phrasing (he is only 26 years old!). One remarkable point of Eric Silberger’s technique is that he usually does not look at his left hand when playing, like Itzhak Perlman. Mundo Clásico: Was your technique a deliberate choice during your career? Is the main objective of this option to achieve a sharper tuning and the production of a better sound? Eric Silberger: I play the way that comes most naturally to me – I have found it more helpful to look at the bow. 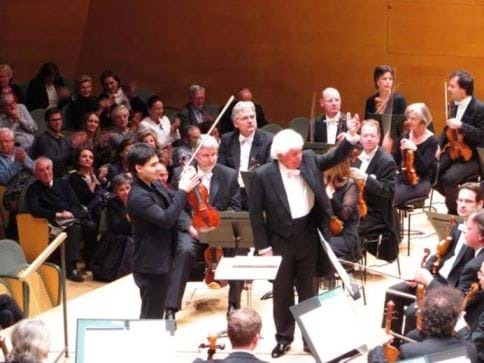 In my studies with Glenn Dicterow (New York Philharmonic Concertmaster for 34 years), Itzhak Perlman, and Pinchas Zukerman, I have always been inspired and learned a lot from observing the playing close up or in the concert hall. I believe they all do things technically that they find helpful in improving the sound, for each person that is something different. Right after the quality of his sound, I would like to highlight Eric Silberger’s mastery of the tempo. There were two very special moments during his performance. Two moments where Eric Silberger made time stop: first, during the cadenza of the first movement of Brahms’ Concerto and second, during Paganini’s Capriccio number 24. During the Capriccio, Eric Silberger made the audience hold their breath for some seconds with his dazzling performance. During the cadenza, for a brief and magical moment, Eric Silberger held back the tempo and the orchestra, as if he were the conductor for a short while. Mundo Clásico: Do you see yourself conducting in the future? Are you already taking steps into this direction? Eric Silberger: I have taken some conducting lessons and discussed conducting with Maestro Maazel. The majority of what I have learned about how a conductor should conduct, rehearse, and make music has been from experiences with Maestro Maazel. I believe to be complete as a musician it helps to be able to approach music from as many different angles as possible. For me this includes composition, conducting, piano, and playing as well as listening to all kinds of music. Virtuoso violinist Eric Silberger is the prize winner of the XIV International Tchaikovsky Competition and the Michael Hill International Violin Competition in 2011. Eric Silberger is also the CEO of Jukubox LLC, a company dedicated to connecting the world through online music lessons. Born to a musical family, Eric Silberger is a fourth generation musician. He began violin studies with his mother at the age of five. Since 2005, Eric has studied at The Juilliard School with Glenn Dicterow, Concertmaster of the New York Philharmonic. He received a Bachelor of Arts in Political Science from Columbia University, and a Master of Music degree from The Juilliard School. His former teachers have included Itzhak Perlman, Pinchas Zukerman, Robert Mann, and Dorothy Delay among others. 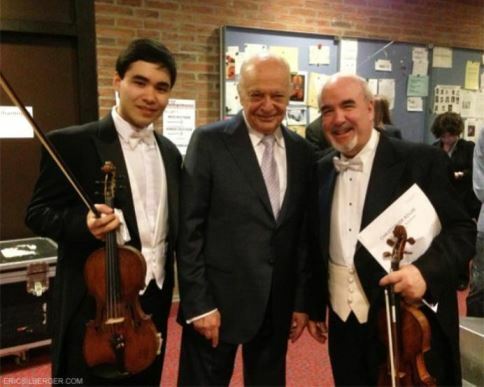 Recently deceased Maestro Lorin Maazel was his mentor. Mundo Clásico: Please, tell us the most important lesson/teaching/experience shared with you by Maestro Lorin Maazel. Why is the most important to you? Eric Silberger: Maestro Maazel’s greatest lesson for me was to “trust yourself”. You have to at a certain point let go and trust your instincts. It is the only way to be authentic is to truly present a personal vision that is uninhibited. Mundo Clásico: What would you choose as the most significant quality of Maestro Maazel: his humbleness, his capacity to work, his optimism, belief, fearlessness, or his sincerity? Eric Silberger: I would say it was his persistence, belief and consistency. He lived life the way he wanted to and had a capacity to work towards his goals with unwavering faith and energy. For next season, Eric Silberger will be reengaged in Minnesota to compose and play a piece for violin and orchestra after his debut of another piece written for violin and orchestra called Homage dedicated to Maestro Lorin Maazel. Next month (April 2015), he will be playing the Mozart 5th Violin Concerto with the Philharmonia Orchestra conducted by Vladimir Ashkenazy, and the Danish National Orchestra conducted by Robin Ticciati. Mundo Clásico: We are aware that you also hold a Bachelor of Arts in Political Science from Columbia University. Please, imagine for a moment that you are chosen to perform a concert in one country at war or in conflict (unfortunately, there are many countries like that at the moment): what composition would you choose as the main piece of the concert? Eric Silberger: For the violin, probably the Beethoven’s Violin Concerto or Bach’s Chaconne. Both works are so very human and have a quality which I believe can bring hope in dark times. They would be pieces I would want to hear in difficult times. A virtuous reply from a virtuous performer: Eric Silberger fulfills Aristotle's definition of virtue as excellence at being human. We all are in need of artists like him.